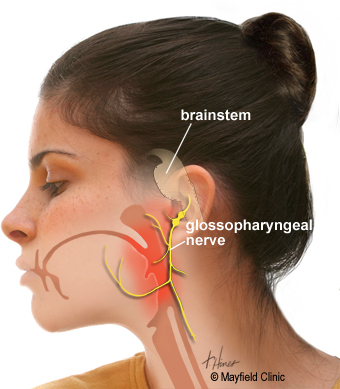 Glossopharyngeal neuralgia is extreme pain in the back of the throat, tongue or ear. Attacks of intense, electric shock-like pain can occur without warning or can be triggered by swallowing. Although the exact cause is not known, a blood vessel is often found compressing the nerve inside the skull. It can also occur in people with throat or neck cancer. Medications may initially relieve the pain, but surgery is often needed for long-term relief. Neuralgia is severe pain caused by injury or damage to a nerve. The glossopharyngeal nerve is the ninth (IX) cranial nerve, which arises from the brainstem inside the skull. It supplies sensation to the back of the throat and tongue and portions of the ear (Fig. 1). When the glossopharyngeal nerve becomes irritated, an attack of intense electric shock-like pain is felt in the back of the throat, tongue, tonsil or ear. You may initially experience short, mild attacks, with periods of remission. But neuralgia can progress, causing longer, frequent attacks of searing pain. Figure 1. The glossopharyngeal nerve begins in the brainstem and exits the skull at the jugular foramen. It sends branches to the back of the tongue, throat, tonsil, ear, and carotid body. Glossopharyngeal pain can be similar to trigeminal neuralgia – and misdiagnosed. Be sure to see a neurosurgeon who specializes in facial pain who can make the distinction. Many believe that the protective sheath of the nerve deteriorates, sending abnormal messages. Like static in a telephone line, these abnormalities disrupt the normal signal of the nerve and cause pain. Most often the damage is from a blood vessel compressing the nerve. Other causes include aging, multiple sclerosis, and nearby tumors. Glossopharyngeal neuralgia is rare compared to other facial pain syndromes. It occurs slightly more in women than men; usually middle age and older. When a person first experiences throat pain, a primary care doctor or dentist is often consulted. If the pain requires further evaluation, a neurologist or a neurosurgeon may be recommended. The diagnosis of neuralgia is made after carefully assessing the patient's symptoms. If glossopharyngeal neuralgia is suspected, the doctor will attempt to trigger an episode by touching the back of the throat with a swab. If that causes pain, a topical anesthetic is applied to the back of the throat and the doctor will try the pain stimulus again. If pain is not triggered while the area is numb, glossopharyngeal neuralgia is diagnosed. Other tests may include an MRI or MRA to look for tumors or a blood vessel compressing the nerve. A variety of treatments are available, including medication, surgery, needle procedures, and radiation. First-line treatment is usually medication. When medications fail to control pain or cause intolerable side effects, a neurosurgeon may be consulted to discuss other procedures. Over-the-counter drugs such as aspirin and ibuprofen are not effective against neuralgia pain. Anticonvulsants, such as carbamazepine (Tegretol), gabapentin (Neurontin), are used to control pain. If the drug begins to lose effectiveness, the doctor may increase the dose or switch to another type. Side effects may include drowsiness, unsteadiness, nausea, skin rash, and blood disorders. Therefore, patients are monitored with periodic blood tests to ensure that the drug levels remain safe. Multiple drug therapy may be necessary to control pain (e.g., Tegretol and amitriptyline). Some people manage the pain trigger by applying a liquid xylocaine to the tonsil area and temporarily numbing it so they can eat and swallow. Microvascular Decompression (MVD) is a surgery to gently reroute the blood vessel from compressing the nerve by padding the artery with a sponge. Surgery is performed under general anesthesia and requires a 1 to 2 day hospital stay. During surgery, a 1-inch opening, called a craniotomy, is made in the skull behind the ear. This exposes the nerve at its connection with the brainstem. A blood vessel (occasionally a tumor) is often found compressing the nerve (Fig. 2). After the nerve is freed from compression, it is protected with a small Teflon sponge (Fig. 3). The sponge remains in the brain permanently. MVD provides pain relief in 85% of patients . The major benefit of MVD is that it causes little or no swallowing or voice side effects. However, there is a 5% risk of death due to manipulation of the nearby vagus nerve, which can cause problems with heart rate and blood pressure. Figure 2 (left). During MVD, a craniotomy is made in the skull. The glossopharyngeal nerve is often compressed by an artery. Lying close by is the vagus nerve. Figure 3 (right). A sponge is inserted between the nerve and the blood vessel to relieve the compression that causes the painful neuralgia attacks. 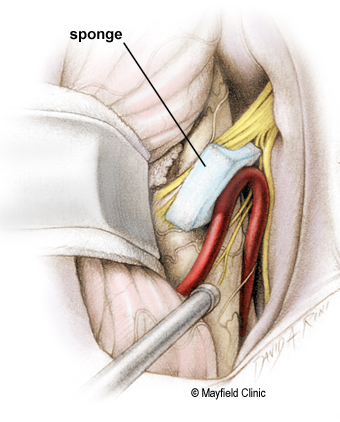 MVD + Nerve Rhizotomy is a surgery to move the artery (if found) and cut the nerve root at its connection to the brainstem. Similar to the MVD surgery, a small opening is made in the back of the skull. If a blood vessel compressing the nerve is not found, or if it cannot be easily moved, the surgeon may opt to cut the nerve. The glossopharyngeal nerve is identified and cut. Then a stimulation probe is used to identify only the sensory roots of the vagus nerve. The sensory root fibers, which transmit the pain signals to the brain, are severed. 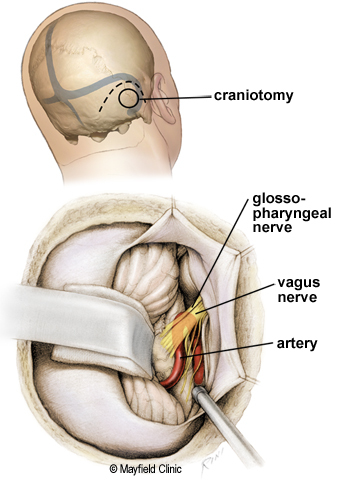 The entire vagus nerve is not cut. MVD + rhizotomy provides 96% long-term pain relief . The potential side effects of rhizotomy are hoarseness of voice, difficulty swallowing (dysphagia), and loss of taste sensation. Percutaneous Stereotactic Radiofrequency Rhizotomy (PSR) is a minimally invasive approach that reaches the nerve through the cheek without a skin incision or skull opening. The outpatient procedure is performed under local anesthesia and light sedation. Patients go home the same day. A hollow needle is inserted through the skin of the cheek into the glossopharyngeal nerve at the base of the skull. An electrode passes a heating current to destroy some of the glossopharyngeal nerve fibers that produce pain. This procedure is typically recommended for those with pain caused by throat or neck cancer. The goal of radiation treatment is to damage the nerve root to interrupt the pain signals from reaching the brain. Stereotactic radiosurgery is a noninvasive outpatient procedure that uses high-energy beams to destroy some of the glossopharyngeal nerve fibers. A stereotactic mask or frame is attached to the patient’s head to precisely locate the nerve on an MRI scan and to hold the head perfectly still during treatment. Highly focused beams of radiation are delivered to the nerve root. In the weeks after treatment, a lesion (injury) gradually develops where the radiation occurred. Pain relief may not occur immediately but rather gradually over time. Patients remain on medication for a period of time following treatment to control the pain while the radiation takes effect. Clinical trials are research studies in which new treatments—drugs, diagnostics, procedures, and other therapies—are tested in people to see if they are safe and effective. Research is always being conducted to improve the standard of medical care. Information about current clinical trials, including eligibility, protocol, and locations, are found on the Web. Studies can be sponsored by the National Institutes of Health (see clinicaltrials.gov) as well as private industry and pharmaceutical companies (see www.centerwatch.com). No single procedure is best for everyone and each procedure varies in its effectiveness versus side effects. If you have more questions, contact Mayfield Brain & Spine at 800-325-7787 or 513-221-1100. Support groups provide an opportunity for patients and their families to share experiences, receive support, and learn about advances in treatments, pain control, and medications. Please contact the TNA Facial Pain Association at 800-923-3608. Taha JM, Tew JM Jr: Long-term results of surgical treatment of idiopathic neuralgias of the glossopharyngeal and vagal nerves. Neurosurg 36:926-30, 1995.
anticonvulsant: a drug that stops or prevents convulsions or seizures. neurectomy: cutting of a nerve to relieve pain. radiofrequency: radiant energy of a certain frequency. rhizotomy: interruption or destruction of a group of nerve fibers by chemical or radiowaves. At Mayfield Brain & Spine, our approach to facial pain is grounded in compassion and personalized care. Our neurosurgeons are experts at diagnosing the various types of facial pain, including trigeminal neuralgia, glossopharyngeal neuralgia, cluster headache, and hemifacial spasm. We offer all available treatment options: microvascular decompression, percutaneous rhizotomy, and radiosurgery. We treat more than 150 people with facial pain each year. To make an appointment, call 513-221-1100. For national and online support groups, contact the TNA Facial Pain Association at 800-923-3608.